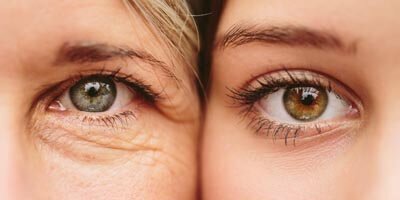 The signs of ageing are often caused by invisible changes beneath the skin’s surface. Anti-wrinkle injections can reduce fine lines and deep furrows in the upper facial area by relaxing the muscles underneath, while dermal fillers can restore lost volume. The aim is to create a relaxed look - not frozen or puffy! Lines appear on the forehead, between the brows and around the eyes, causing frown lines and crows feet - and a sagging appearance that can give a tired, worn look. Prolonged sun exposure causes pigmented age spots to appear, while skin around the eyes can become darker in colour and start to ‘hollow’. Wrinkle injections, dermal fillers, laser therapy and the right combination of active skincare ingredients can address these concerns. Repeated muscle action from expressions like smiling or being angry causes wrinkles to appear around the forehead between the brows and around the eyes. 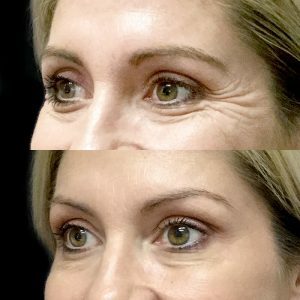 These wrinkles can then deepen and become more permanent - they are called ‘static’ lines, and can be softened through the use of cosmetic wrinkle injections. Likewise, as we age, we loose muscle tone in our face, which changes the shape and firmness; this can be replaced by dermal filler. The smooth, full curves that give our face a healthy, vital appearance are largely due to fat pads under our skin, which shrink and move south as we age. Diminishing fat pads cause a reduction in facial volume and the hydrated appearance of our skin. As a result, it also creates hollowing around the forehead, eyes and temples, giving a ‘sunken’ look. Dermal fillers restore lost fat, with a soft range of gel options, mimicking lost volume. 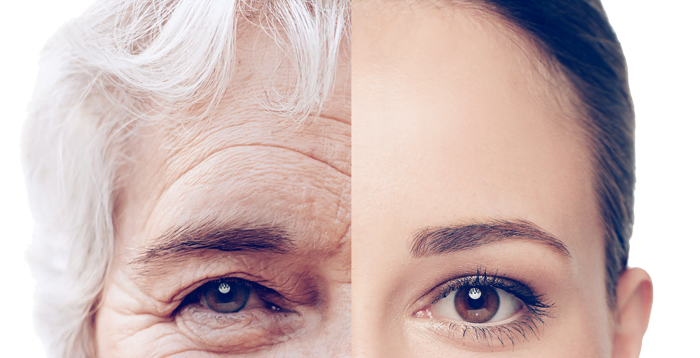 Just like other areas of the body, our facial bones also begin to diminish as we age. Even the healthiest people find that the actual structure that once provided support to the skin, muscle and fat pads decreases, loosing shape, firmness and volume. 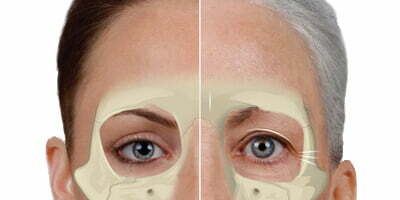 Bone loss around the eye and temples area contributes to the formation of hollows that give a sunken appearance. A firm dermal filler can be strategically placed to replace lost bone structure in the upper face. What causes upper face ageing? Lines on the forehead, crow’s feet and those deep furrows between the eyes are the result of repeated muscle contractions from our facial expressions. When our skin loses elasticity as well, these lines stay put, even when our face is at rest - these are called static lines. These lines can prematurely age the face, making us look older or more worn than we feel. Consequently, they’re an areas that areas many women and men would like to do something positive about. [Right: before and after wrinkle injections for crows feet]. Will I look frozen puffy or fake with cosmetic injections? 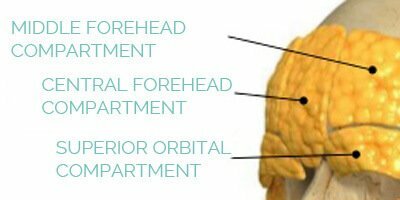 Our approach to upper face ageing is committed to producing natural-looking results. This is achieved through our techniques, the type of product injected - and the amount used. What is it like to have cosmetic wrinkle injections or dermal fillers? 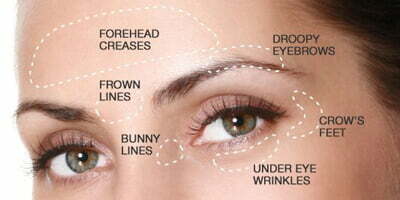 Anti-wrinkle injections are a quick, safe, non-surgical option for smoothing out the upper face area. For muscle relaxants, minute injections into the muscles underneath cause them to temporarily relax. The treatment takes a few minutes, and over the coming days and weeks you’ll notice a softening of the appearance of lines and creates smoother looking skin. Dermal fillers can also be used to restore the volume and moisture loss that also accompanies the passage of time, creating a plumper, more hydrated look. Around they eyes they can add volume above your eyes to achieve a less tired look and, when combined with anti-wrinkle injections, contribute to an overall rejuvenation of the upper face. Dermal fillers are injected using a fine needle or cannula, and create an immediate result. Simple and in most cases very tolerable, anti-wrinkle injections have a greater effect when they are done regularly - every 3 to 4 months preferably. Which cosmetic injections are right for me?